While the chair car fares are 1.5 times the base price of Shatabdi trains running the same distance, the executive class fares are 1.4 times that of the base fare of first class air conditioned seating in the premium train. Travelling between Delhi and Varanasi on board India’s fastest train, the Vande Bharat Express or Train 18, will cost passengers Rs 1,850 in the chair car class while it will be Rs 3,520 in the executive class, including the catering charges, a senior railway official said on Monday. The semi-high speed train, which is scheduled to be flagged off by Prime Minister Narendra Modi on February 15, is India’s first engineless train. Between Kanpur and Prayagraj (195 km) the price for CC will be Rs 630 and for EC it will be Rs 1,245. The prices between Kanpur and Varanasi (319 km) a CC ticket will cost Rs 1,065 and an EC ticket will cost Rs 1,925, the sources said. 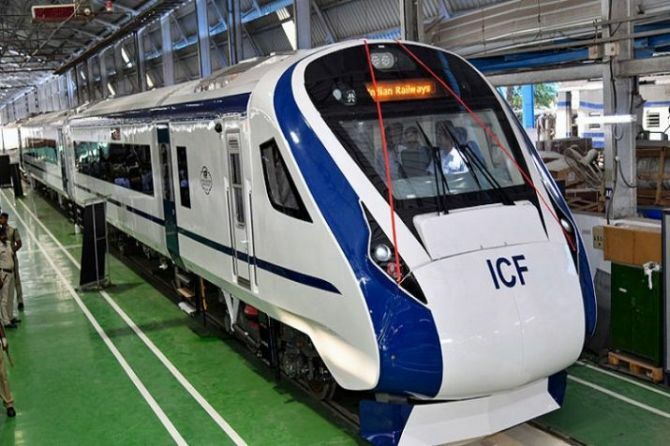 The Train 18, manufactured under the ‘Make in India’ initiative at ICF, Chennai, is India’s fastest train, having attained speeds of over 180 kmph during its trials. On the Delhi-Varanasi route, however, the section speed restrictions would mean that the new train set will hit a maximum speed of 130 kmph. « Is That Bourbon in My Häagen-Dazs?